NEITHER MAN'S WOE NOT JUST TO WOO MAN! Man to God : Why did you make women so beautiful? God’s reply : So that you can love her. Man to God : But then why did you make her so foolish? God’s reply : So that she may love you. But on a serious note it is pertinent to note that a man’s life revolves round the Woman – from birth to death. Before entering the physical world – he comes to life nourished and protected for nine months, growing in the womb of his mother – a Woman. During his initial growing years he spends most of his waking hours in the lap or arms of his mother, grandmother, aunt, sister – all Women. A little older and the women of the house are assisted in feeding, bathing, cleaning, taking him to the park by the maid – also a Woman. His basic education from the nursery to the kindergarten and to some extent Primary school, nurturing him through his growing years into his teens is by teachers – all Women. As a teenager, maintaining a respectful distance from his father, he confides in, shares his joys and sorrows, expresses doubts and throws tantrums at his mother – a Woman. Then things take a turn, he wants to build up his male identity, prove he is not inferior, try and assert his dominance. He seeks appreciation for winning laurels in sports or academics and whom is he trying to impress all the time? His mother and the girls in the neighbourhood – all Women. Then comes college – the wooing of the girlfriend, the pursuit and finally the conquest (so he feels) – marriage – to a Woman. Now he can proclaim his superiority, throw his weight around at home and office – target – Women. A little later when he confronts the trials and tribulations in life, be it at the office, or in business, where does he turn to for solace? His wife’s shoulder (or a mistress!) – a Woman. And at the fag end – retired, at times in poor health, with hardly any socializing left, the children leading their own lives – who takes care of him as a nurse and companion? His wife – a Woman. I am not trying to belittle man – only trying to project the woman in a proper perspective and acknowledge her worth. So when Arun said “Let’s do an issue on Sindhi Women”, my prompt response was “most certainly – it’s high time we paid our tributes to this glorious creation of God”. 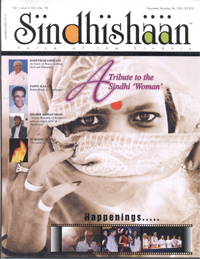 With this issue Sindhishaan has decided to provide our readers with a couple of articles in each issue, which may not be Sindhi specific, but are topical and provide interesting reading.